The days-old newborn shook and screamed, his tiny chest fluttering with rapid breaths. Even his mother's arms couldn't soothe him. Withdrawal from heroin was Jordan Barkley's first experience of the world. His mom, Amy Kalber, shot up every day for most of her pregnancy. The drugs coursing through her body sickened Jordan, who spent seven weeks in neonatal intensive care, suffering from diarrhea and tremors, sucking on morphine as he weaned off the heroin. "It breaks my heart. It really does," said Kalber, 33, who is now in recovery. "I just couldn't stop. With heroin, you have to do it. You have to get it. It doesn't stop." Kalber's story is all too common in Kentucky. A recent research letter in the journal JAMA Pediatrics says the state had more than twice the national rate of drug-dependent babies in 2013, the most recent comparable year - 15.1 cases per 1,000 live births when the U.S. rate was 7.3. Both were up substantially from five years earlier, and Kentucky's rate jumped another 40 percent the following year. "We have mothers who are addicted throughout pregnancy and their addiction is more or less passed down to their babies," said Joshua Brown of the Institute for Pharmaceutical Outcomes and Policy at the University of Kentucky, one of the authors of the research. "The trend just keeps going up and up and up." In 2012, The Courier-Journal broke the story of a 2,400 percent, 11-year rise in Kentucky hospitalizations for drug-dependent newborns, becoming one of the first media outlets in the nation to shine a spotlight on the issue. And the numbers have just continued to skyrocket, with 1,234 drug-dependent infants reported to the state health department in the year ending July 30, 2015. "We've had one of the country's worst prescription drug problems," which has spawned a burgeoning heroin epidemic, said researcher Jeffrey Talbert, who directs the pharmaceutical institute. "We need more treatment providers and more access to care." A Courier-Journal analysis of U.S. Substance Abuse and Mental Health Services Administration data shows only 30 of the 123 substance abuse treatment facilities in Kentucky accept pregnant or post-partum women. Only eight are long-term residential programs. 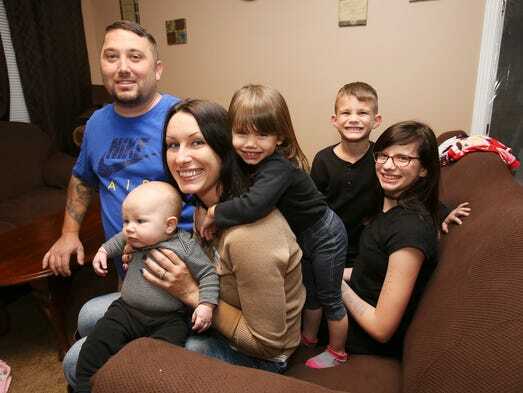 Kalber landed a coveted treatment spot shortly after Jordan's birth in 2011 and spent nine months getting clean through a Volunteers of America program for pregnant and postpartum addicts called Grace House. She said that's what saved her and her family – a sanctuary and God's grace. Growing up in Virginia with an alcoholic single mom, Kalber smoked her first joint at age 11. She did it to fit in with older, popular girls, and still recalls the escape, the feeling "everything was better." She quickly began popping pills that she'd find in friends' medicine cabinets. By 13, she was drinking and using crack cocaine, getting high in school bathrooms. At 14, she stole a car with a friend and drove it to Georgia. By 19, she was pregnant by a boy she met in a school for troubled kids. Kalber cut back on the drugs during that pregnancy but admits using the anti-anxiety medicine Xanax two or three times and drinking a handful of times. She said her daughter, Luca, probably had drugs in her system but wasn't tested and seemed fine. Within a couple months of the birth, Kalber was using all sorts of drugs again – including, for the first time, cheap and available heroin. Sometimes she dragged Luca along as she wandered from place to place, she said, and sometimes the baby lived with her grandparents. Kalber's addiction raged for five years, and in 2009, a friend brought her to the doors of the Healing Place in Louisville in the hopes she would get sober. She didn't. She met fellow addict Chad Barkley there and eventually became pregnant with Jordan. Pregnancy didn't stop them from shooting up heroin every day. They often downed Beam's Eight Star 80-proof whiskey, too. Drunk and high much of the time, the couple got evicted from two places and wound up in a threadbare shack behind an abandoned apartment complex with no water or electricity. Knowing she was hurting her unborn baby, Kalber tried three times to get clean at JADAC, now Centerstone Addiction Recovery Center. She left each time. One February morning, she woke up in the cold shack, her water breaking. She knew she should get to the hospital, but didn't go right away. She needed a hit of heroin first. At University of Louisville Hospital, Kalber tested positive for drugs. And when Jordan was born at 11:30 that night, the nurses and doctors only let her hold him for a few minutes. "We're sending him off," she recalls one of them telling her. "He's sick." An emergency custody hearing was held at the hospital, and Jordan was assigned to a foster family. Kalber took a few trash bags of clothes – all her belongings – and went to The Healing Place to detox. But before going in, she sat in the parking lot and "just drank and drank." Exhausted after the detox program, Kalber made a desperate call to Volunteers of America, telling them: "My son needs help. I need help." VOA's program often has a waiting list 20 to more than 30 names long, but luckily had a bed. "It was like a home" that also offered recovery meetings, parenting classes, and relapse prevention, she said. "It was so clean and safe and I slept in a clean bed." Researchers and experts say the only real way to bring down the numbers of drug-dependent babies - aside from reducing Kentucky's overall drug problem – is to provide more care for moms like Kalber. "Let's get people drug treatment," said Jefferson Family Court Chief Judge Paula Sherlock. "We may need to get them help with housing as well." There are signs of progress.VOA has closed Grace House but runs a 20-bed facility called Freedom House and plans to break ground in March on a new facility on Second Street that will open in the summer and serve 16 more women. In 2015, Kentucky became one of 11 states to receive up to $3 million in federal grants to provide expanded treatment to pregnant addicts. That was in addition to $1 million in state funds for transitional care and other services that came from an appropriation in the anti-heroin bill passed that year. And on Wednesday, state officials announced they will apply for up to $10 million in federal SAMHSA funding to fight the opioid epidemic, and one of their priorities if they get it will be to help pregnant addicts. On a federal level, the Protecting Our Infants Act of 2015, co-sponsored by Sen. Mitch McConnell, R-Kentucky, calls for, among other things, spreading proven practices to prevent and treat maternal opioid abuse and recommendations for treating drug-dependent infants. But researchers said far more drug treatment is needed in Kentucky, as well as more research and help for babies. Long-term effects remain largely unknown, although some research has linked drug-dependence at birth to Attention Deficit and Hyperactivity Disorder. Jordan, now a 5-year-old kindergartener at the Brown School, has ADHD but is in therapy. He's rambunctious, intelligent and loves indoor sports and fishing with his dad. Kalber said she's worked hard to give him a stable life since those early, chaotic days. She and Barkley, who is also in recovery, are still together and envision getting married someday. She's a case manager at Choices, a program for homeless women and families, and he installs floors. They live in a small rental house near Churchill Downs, and both are now studying at U of L's Kent School of Social Work. They go to 12-step programs and help other addicts. Since Jordan was born, they've had two more children, both born healthy. On a recent evening, Kalber cuddled baby Marty in her arms as 3-year-old Rori played with a cell phone on the couch. "These two have never seen a drink or a drug," she said. And she's determined they never will.